January was healthy breakfast recipes month at Blissful Roots. Today, I'm taking a step in the complete opposite direction. This recipe falls into the dessert-for-breakfast category. It's the weekend special at our house. 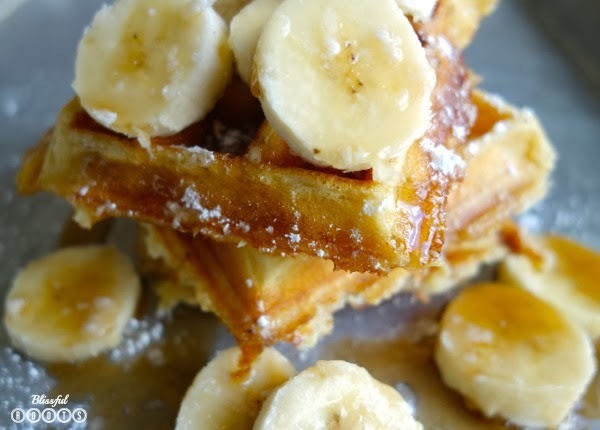 We only have waffles once a week, so it's okay to splurge! My sister made these buttermilk waffles for us last time we stayed at her house. 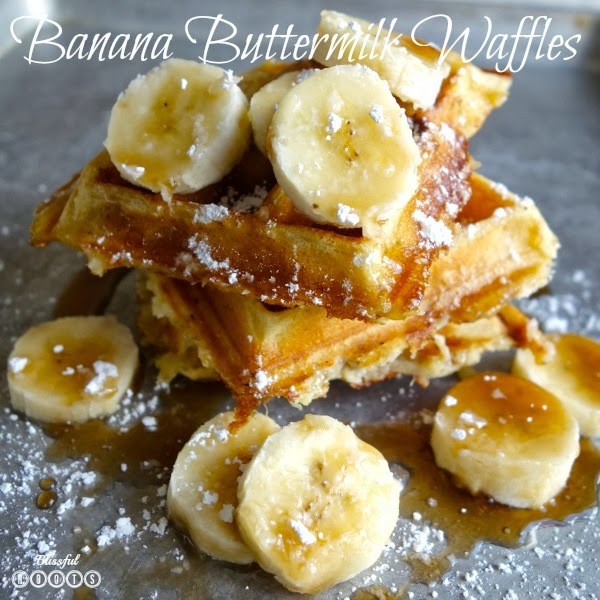 We usually just use Krusteaz mix, (and actually mix equal parts of water and mix to make the waffles thin and crispy) but after one bite of the homemade buttermilk waffles, I was sold! The recipe comes from Better Homes & Gardens. Make sure you scroll down to the middle of the page to find the buttermilk variation. 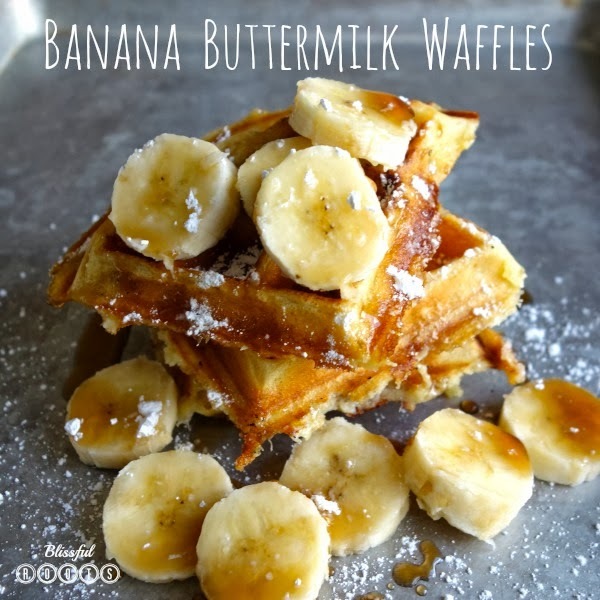 Then, just stir in one or two very ripe mashed bananas to the batter before you put it on the waffle iron. And for me, nothing ruins a waffle more than store-bought syrup. Does that sound a bit snobbish? It's true! I really can't stand store-bought syrup. I grew up on homemade, so I guess that's just what I'm used to. Here's the homemade maple syrup recipe we always use at our house. It's so, so easy! Three ingredients, and a few minutes. That's it. I guarantee you'll be converted! I've always loved waffles better than pancakes, and I love waffles the most when they're cooked with the right waffle iron. I have a single Belgian waffle maker, and my mother-in-law has the double version of it. I love it because you can cook two at a time, and they're perfection every time! She has this Waring Pro one. It is a bit of an investment, but if you're a waffle family like we are, then it's worth it! We even used it to serve waffles and amazing toppings at my sister-in-law's wedding reception last spring, and it worked like a charm for a good-sized crowd. I honestly can't eat waffles without bananas in them any more. They add such wonderful flavor (if you like bananas), and at least I feel like I'm getting a bit of nutrition amongst my dessert breakfast.